We soon settled on a Stars and Moon theme with blues, yellows and purples and I LOVE IT! It is not too girly but still cute and fun! 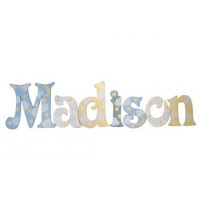 Sweet Peaches Bedding has helped me decorate my daughter's room with their super cute and personalized Wall Letters! You can also design the room of your child's dreams with kids bedding sets from Sweet Peaches Bedding. They offer a wide range of high quality children’s bedding for every stage of life. Their Baby Bedding collection will allow you to design the perfect nursery for your little bundle. When it’s time to move from crib to your child’s first bed, their Toddler Bedding will ensure you find the perfect set to complete the transition. The walls are painted, your Sweet Peaches childrens bedding set is ordered, and now it's time to accessorize! Accessories add splashes of color and personality that will pull your room together for a polished and personalized look. Whether you’re looking for a lamp, pillows, or wall plaques, Sweet Peaches Bedding has a large selection of stylish accessories just a click away! I generously received my daughter's name in the Moon and Stars Wall Letters. They are custom painted and their talented artists can customize any letter to best coordinate with your bedding or decor. All letters are hand-painted with child-safe acrylics and sealed with water-based polyurethane. Letters are 1/4 inch thick and are available in 8" and 10" heights based on the capital letter for the font. Available with ribbon, sawtooth hanger or jute rope. We had to redecorate the nursery from our Jungle Theme with my son to our Stars and Moon theme with my daughter. We had a lot of wall space to fill and I was at a loss at to what to put on it to match our Stars and Moon theme. When I saw these super cute Moon and Stars letters from Sweet Peaches Bedding, I knew it would be perfect for filling up the wall space and fitting the theme perfectly! I absolutely loved how the colors could be personalized along with the name to fit the nursery colors and my daughter's name! They turned out beautifully and I love the hand painted details and sparkles! It fits perfectly in the nursery and matches the other colors perfectly! I also love how you can pick what kind of hanger you want depending on the wall and way you want to hang the letters! If you are looking for items to decorate your nursery or child's room, you have got to check out Sweet Peaches Bedding! I especially recommend the handpainted and personalized Wall Letters! They are so beautiful and are made especially for your colors and room theme! Buy It: You can purchase the Wall Letters for $20 (per letter) from the Sweet Peaches Bedding website. Win It: Sweet Peaches Bedding is generously offering (1) $50 gift certificate to a lucky winner!